Here you find new guns & rifles from our production. Few single pieces that we are, as a rare occasion, glad to offer immediately. Elegant Fanzoj Kipplauf, cal. 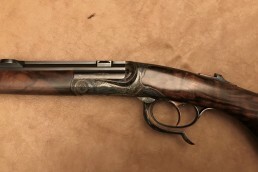 5,6x50RM, the latest model from our production, with underlever opener, safety hand-cocking mechanism, forward set trigger and octagonal barrel as a special feature. Weight: 2,2kg/4.8lbs (2,75kg/6lbs with scope), barrel length 58,5cm/23inch overall length 101,5cm/40inch.